Unai Emery and superstar Mesut Ozil’s relationship is once again under question as it was revealed yesterday that Ozil withdrew himself from Arsenal’s match-day squad for the 3-1 win against West Ham following a training ground argument with the new man in charge at Arsenal. Emery shot down rumours that there was an argument and insisted Ozil wasn’t part of the match-day squad because the now retired German international has been suffering from a cold in the past week. 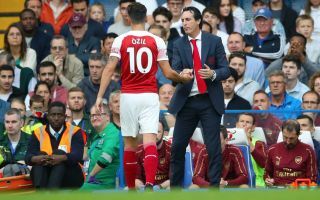 Emery also told the press that whilst Ozil wasn’t part of the match-day squad he did travel with the side yesterday to show support to his teammates. The Daily Mail reported that Emery has been demanding more from Ozil on the training ground in recent weeks with the Spaniard’s tactical system needing the number 10 to work harder defensively if the team is to be a successful part of it. Ozil has been under fire recently after poor displays in the Gunners opening two Premier League fixtures against Manchester City and Chelsea – the latter of which he was dragged off by his manager. Fans are still calling for the use of Ozil in the no.10 role as opposed to Aaron Ramsey who played there in yesterday’s 3-1 victory over the Hammers. Ramsey can't really play 10. Doesn't seem to know where to start positional and we lose his runs from deep. Xhaka is clearly a leader on the pitch in terms of instructions. Ozil is so important to build up play and transition. Ozil can no longer afford the luxury of not contributing to his side defensively and his efforts on the training ground and on the pitch will have to improve significantly if he his to get his Gunners career back on track. Is Mesut Ozil really worth the hassle? No - if he can't be bothered, don't play him!